This summer has been a real turning point for me with the children. For the first time I have been able to let them play in the garden without me being outside with them. I always stay within earshot and am usually just tidying the kitchen where I can see into the garden, but it has made SUCH a difference. Even just 10 minutes of tidying in the day frees up our evening that bit more…and every little helps. Z and S are brilliant at making up their own imaginary games with few props, but I also like to see them running around, so we’ve been space hopper racing, relay racing and sack racing. I’ve had so much fun, not only watching the kids giggling away, but joining in with them too. Argos kindly sent us a bucket set which we will take on our next holiday with us and a croquet set. 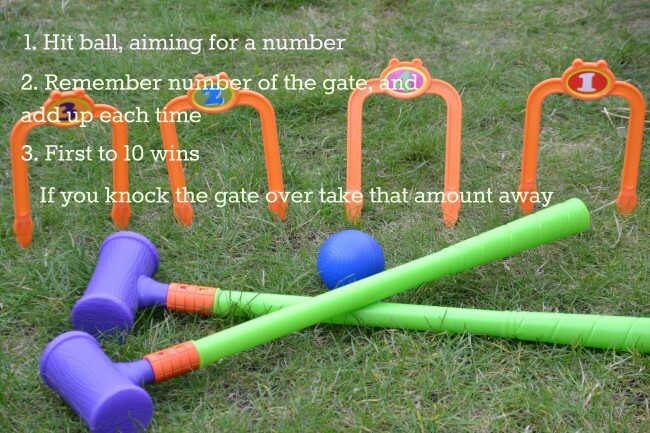 We made up a maths game with the croquet set which Z and S thought was great fun! Argos also gave us some other great ideas for outdoor games including an obstacle course involving tunnels, kicking balls at a target and throwing a ball through a hula hoop and a rainbow treasure hunt where you look around the garden to find objects of different colours. Thanks to Argos for the croquet set and bucket. You can see more fun ideas here. Oooh great to bring out those traditional garden games! Wonderful. Totally and Thanks for sharing on Kids Get Crafty! Thank goodness the weather has inproved, so we can all enjoy the outside more! Oh yes, it makes such a difference! This looks like a fun outdoor game. We used to play crochet as kids and always loved it. I didn’t even realize that you could buy plastic sets for younger kids! Outdoor fun and games – Mummy..Mummy..MUM!! !